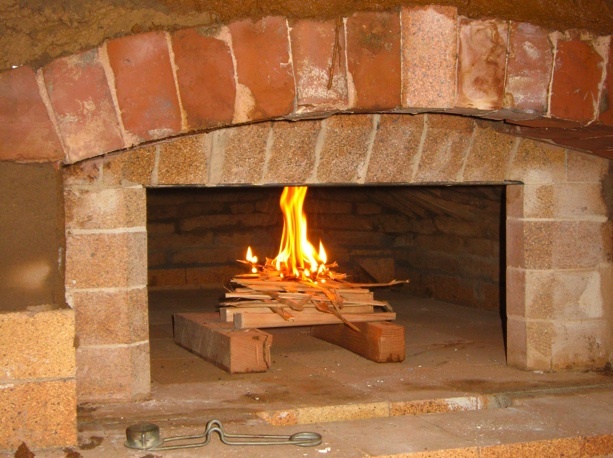 You can greatly improve how your oven performs by how you lay and manage the fire. Here’s how and why I build what Pat Manley calls “an upside down fire.” (Follow the link to an overlongÂ videoÂ version).Â The first principle of fire requires applying to heat to fuel. When the fuel gets hot enough, it bursts into flame. But if you pile many pounds of wood on top of your kindling, it will take a long time before all your fuel can really start burning. Meanwhile, you’ll get a lot of smoke in your (and possibly your neighbors’) eyes, and you’ll lose a lot of fuel (all that smoke counts as unburnt fuel). So turn your fire upside down! It will start small, but a small fire can heat up quickly. As it does, it will drop down deeper to ignite more fuel in your stack. The stack itself should be as open as possible, and made of sticks that get progressively larger — tho I limit the size of the bottom sticks to about 2×4 or 3×3 inches. The reason to keep the fuel small also comes from a basic principle of fire, by which surface area and mixing of fuel with oxygen both limit the rate of burning — that’s why three sticks burn better than one or two. If you pack them too tight together, however, you won’t have enough room for the air to get in there and mix it up. Remember that burning means oxidation — to burn clean, fuel andÂ oxygen must combine fast and complete. Otherwise, instead of creating heat with just a bit of water vapor and carbon dioxide, you get heat with a lot of poisonous gases. When your fire generates enough heat to engage all the fuel, you’ll have a roaring fire that’s hot enough to ignite another (small) load of fuel. It’s important to load only as much fuel as your fire can heat up and burn quickly. Otherwise, Â not only will you get a smokier fire, you’ll also need a lot more time and wood to get your oven hot — as much as twice as much fuel, and a third more time.